Pidato bahasa inggris tentang narkoba sangat diperlukan untuk para siswa karena anak-anak & remaja adalah yang paling banyak terjebak kecanduan narkoba. Agar lancar dalam pidato nantinya alangkah sempurnanya jika Anda sudah menguasai percakapan bahasa inggris yang bisa Anda pelajari dari website belajaringgris.net ini. para remaja adalah sasaran empuk bagi para penjual narkoba karena saat remaja adalah masa pencarian jati diri & mereka penasaran dengan berbagai hal baru serta suka coba-coba. Agar mereka tidak terjebak dalam pergaulan yang negatif kita bisa mengajak mereka belajar bahasa inggris dengan mendengarkan pidato bahasa inggris tentang narkoba berikut. Good Morning Ladies And Gentlements. Thank for the chance that has been given to me. My name is Tascia.. I’m representative ….. The honorable . mr…….. …. …. And all the young generation that present here. 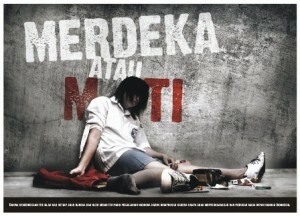 Thousands of young men have wasted their lives because of illicit drugs in our country, Indonesia. They were mostly victims of a ‘cruel’ environment, a broken-home family, of ignorance, of curiosity or particularly of the illegal drugs mafia. It is estimated that around 4 million people in Indonesia illicit drug users – about one in every 50 Indonesians. In the capital city of Jakarta, it is estimated that three out of ten young people are users. A study by the International Labor Organization (ILO) office in Indonesia showed that around four per cent of illicit drug users in the country are children under 17 years old. Two out of ten users are involved in illicit trafficking. Some teenagers start being involved in producing and trafficking drugs between the ages of 13 and 15. Chairman of the National Narcotics Coordinating Board said that the country’s illicit drug users include around 7,000 junior high school students, over 10,000 senior high school students and about 800 elementary school students. People usually take drugs to have fun or escape the pressures of life. Drug users among students are particularly worrying. It was reported that a number of traffickers operate around schools by cheating, forcing or giving free illicit drugs to students. Once the students are addicted, they then go to the traffickers to buy the illicit drugs. If they do not have money, they steal it from their family members or others. Narkoba’ is the Indonesian term for narcotics, psychotropic and addictive substances. Psychotropic substances popularly called Ecstasy and Shabu-shabu are considered favorites among the middle and upper class users. However, for an increasing number of young people, the drug of choice is low-grade heroin, known as putaw, which is cheap, plentiful, but potentially deadly. These drugs are readily available in all major urban areas, including schools, Karaoke lounges, bars, cafes, discotheques, nightclubs, and they even spread into remote villages. Therefore it is not surprising that drug users continue to increase from year to year. The facts above showed us how familiar “Narkoba” issues In our young generation. First we should know what’s the meaning of drugs addiction? Drug addiction is a complex brain disease. It is characterized by compulsive, at times uncontrollable, drug craving, seeking, and use that persist even in the face of extremely negative consequences. Drug seeking becomes compulsive, in large part as a result of the effects of prolonged drug use on brain functioning and, thus, on behavior. For many people, drug addiction becomes chronic, with relapses possible even after long periods of abstinence. The Definition confirm us how serious the consequences of using Drugs. then, what can we do as the young generation? Prevention is better than cure. AVOID the Drugs, don’t ever think to try just b’coz you curios. because once you try, you will be trapped and later become addicted, and the addiction will finally turn you into criminals or take your lives. We have so many example around us, what happened to the users. Some b’come crazy, Some was going to the jail, And The others were died. All of them loose their future. I believe we don’t want such things happened to ourselves. Now its time for us to say ‘NO’ to drugs. It’s time for us to arrange our future. It’s time for us to face the world with our ability. It’s time for us to prove that we can do something for our country, With The spirit of ‘Indonesian Awakening Day’. for my english speech contest ! tx my sister from your speech….